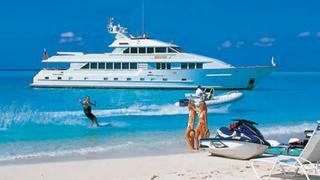 If you are planning on chartering a superyacht then water toys are all part of the package. In recent years the “toy boxes” on luxury yachts have become increasingly varied and exotic. Whether your preference is for the speed of a Jetski or the more sedate pleasure of snorkelling among tropical fish, there is a water toy to delight every charter guest. Personal watercrafts — known as PWCs — are ubiquitous with a luxury yacht charter. 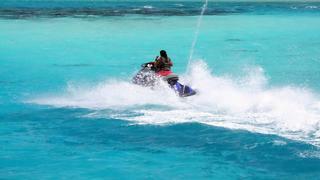 Easy to learn how to ride, the PWC is like a waterborne motorcycle, but far safer. Fall off a PWC, and you just get a dunking. Most are designed to carry two or three passengers and can allow family members to zip around together for wet fun. A mega-yacht charter is likely to include a selection of inflatables that can be towed behind the tender. The banana boat is popular, allowing several guests to ride this bouncing, splashy tube that is the nautical version of a bucking bronco. 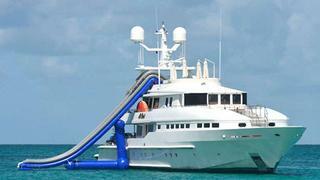 Some yachts have inflatable versions of a water slide, allowing guests to zip from an upper deck into the water. There are even charter versions of zip lines, which take guests from the top deck to a splashdown far from the yacht. Charter yachts should have masks and fins in all sizes and shapes. Many yachting destinations feature fabulous snorkelling and being on yacht means that you can access to some of the world’s most exclusive reefs. If you have experience and the appropriate certificates many yachts have a full complement of scuba diving gear aboard. 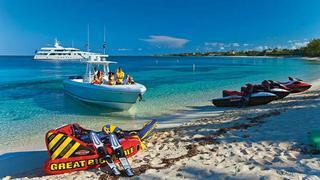 Others may offer rendezvous diving, where a local scuba company meets with the yacht and leads guests on an underwater adventure. Whether you are an experienced water-skier or an absolute novice, charter yachts often have tenders that are perfect for everything from carving a slalom on glassy water to helping you get on your feet for the first time. Sailing dinghies and kayaks are also growing popular along with windsurfers and the latest rage, kite surfers. Many charter yacht crews are experienced in all of these sports, and can help you learn or take you on a tandem outing. 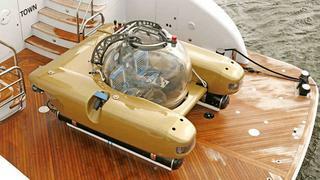 A new underwater toy now found aboard some charter yachts is the Seabob. It is a James-Bond style water sled that tows the swimmer, above or below the water, without requiring swim fins or effort. At the more exotic end of the water toy spectrum, some expedition yachts carry a luxury version of an amphibious jeep, allowing guests to get to shore and then explore islands where there may be no other automobiles. Finally, of course, there is the latest rage: mini-submarines. These are fully equipped submarines designed to carry the captain and a few guests on adventures straight from the pages of Jules Verne.